In tennis terms, you break someone when you win their service game since being the server is a distinct advantage. Holding is when you win your own service game. In order to win a tennis match, you must both break the other person and hold your own serve. Sometimes this is done by pure skill and other times, it requires not only skill but concentration, determination, and psychological strength. 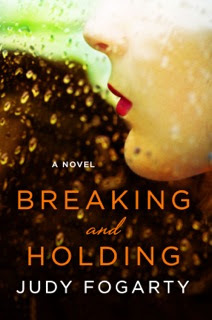 Judy Fogarty's novel, Breaking and Holding features characters who are trying very hard to both hold serve and break those who would dominate the game, marriage, life, the future. Patricia Curren is a beautiful woman who looks good on the arm of her wealthy, advertising agency owner husband, Jack. He has never valued her for the things that matter to her, like her love of literature. He insists she wear colored contacts to cover her one visible flaw: one blue eye and one grey eye. Twenty years older than she is, he is domineering and controlling and she defers to him in all things, feeling appreciation that he rescued her from a sad and guilty childhood. As the story opens, Jack's indispensable assistant, Lynn, the best and only friend Patricia has, is looking back to the summer that changed the status quo, that challenged the Curren marriage, and allowed a whole new world to open up to the meek, weak Patricia. When Patricia finds a black button in her bed, she knows that Jack has been cheating on her. She wants to leave Jack but she doesn't have the courage. What she does have the courage to do is to remain on Kiawah in their summer home when Jack goes back to New York. Deciding to learn tennis, Patricia meets Terry, a college kid on the cusp of turning pro if he can just find a sponsor. The two of them quickly descend into a steamy affair. When Jack sends Lynn down to Kiawah to run an ad campaign and to check on Patricia, she discovers Tricia (she's now going by a nickname) and Terry consumed by each other. But Lynn can hardly say anything since it was her black button in the Patricia's bed. The summer has to play out the way it does, rife with betrayal, devastating secrets, heartbreaking revelations about the past, and steeped in obsession. Told mainly from Lynn and Patricia/Tricia's points of view, this novel showcases the struggle of two women to break free of expectations and to forge lives of their own creation. Tricia and Terry spend the majority of the novel completely wrapped up in each other. Their love is meant to be incandescent but it comes off as immature and self-absorbed. Both characters suffered unhappy childhoods, Tricia in the death of her parents when she was small, and Terry because of a cold and driven mother who saw him only as a tennis prodigy and not as a son to love just for himself. Perhaps because of this loss of or lack of love during their formative years and their eventual revelations to each other about their pasts and the wounds they carry, their relationship feels more like an high school obsession than an adult relationship that can be sustained long term. Their lives are no less dysfunctional when they are together than when they aren't. In the end, Tricia does find a strength she didn't have in the beginning but the reader never sees her develop or uncover that strength, the author just tells you that's the case through Lynn's distant narration. As for Terry's tennis career and the tennis scene of the 70s, there really is very little included for the novel taking place during the height of tournament season when aspiring pros are at a tournament every weekend. Secondary characters were, for the most part, pretty one dimensional. Roommate and doubles partner Baze is a good guy. Terry's mom, Jack, and potential sponsor Nona have no redeeming characteristics at all. I know I'm in trouble when even small things bother me like Terry nicknaming Patricia despite her request that he not call her Tricia followed by her decision that no, in fact she likes the nickname. Instead of it signaling her as a different, stronger person, it seemed to me to reinforce the malleability of her as a person, acquiescing yet again despite her initial wishes, a pattern that held through most of the story. I really wanted to like this tale of infidelity, tennis, and breaking free but I just couldn't get beyond childish character whom I never cared about or particularly liked or sympathized with. It appears that I am definitely in the minority on this though so if the story line interests you, you should definitely try it and let me know in the comments what you thought of it. For more information about Judy Fogarty and the book, check out her author website, like her on Facebook or follow her on Twitter. Also, check out the book's Good Reads page, follow the rest of the blog tour, or look at the amazon reviews for others' thoughts and opinions on the book. Thanks to Lisa from TLC Book Tours and the author for sending me a copy of this book to review.